How can I get rid of moles in my yard? My grass is brown during the winter. Is it going to be ok? Tall Fescue lawns in the Raleigh, NC area can suffer some damage during the summer from drought, heat, fungus, lawn equipment, pests, pets, or playtime. Fall is the season to fix the damage and get your Fescue lawn looking its best. Between about early/mid-September and mid-October in the Raleigh, NC area is the best time for Tall Fescue grass seed to germinate, and Tall Fescue seedlings that sprout in the fall have several months to become established in order to survive the following summer. Spring-seeded Tall Fescue is unlikely to survive summer stresses. What Should a Lawn Renovation Consist Of? A Tall Fescue lawn renovation should consist of core aeration, a good quality fertilizer with a balance of macro and micro nutrients, and a good quality blend of Tall Fescue seed. How Can I Get My Lawn Aerated? You have a couple of options for getting your lawn aerated. You could do it yourself by renting an aerator from a local equipment rental store. A few of your neighbors may be interested in splitting the cost and doing their lawn renovations at the same time. Another option is to hire a lawn care service, such as Crownover Green, to aerate your lawn. For Crownover Green clients, core aeration is included in our seasonal lawn care program. How Can I Get the Most out of My Fall Lawn Renovation? If you are hiring someone else to aerate your lawn, use brightly colored spray paint or marking flags to mark obstacles. Mark sprinkler heads, valve covers, pest control stations, and anything in your turf that aerator tines could damage if workers do not notice them. Small obstacles at ground level or those partially obscured by grass may not be observable while operating machinery, so your are better off to be safe than sorry. Additionally, if you know a neighbor has underground obstacles near your property line, please arrange to either mark the obstacles or mark the property line ahead of time. 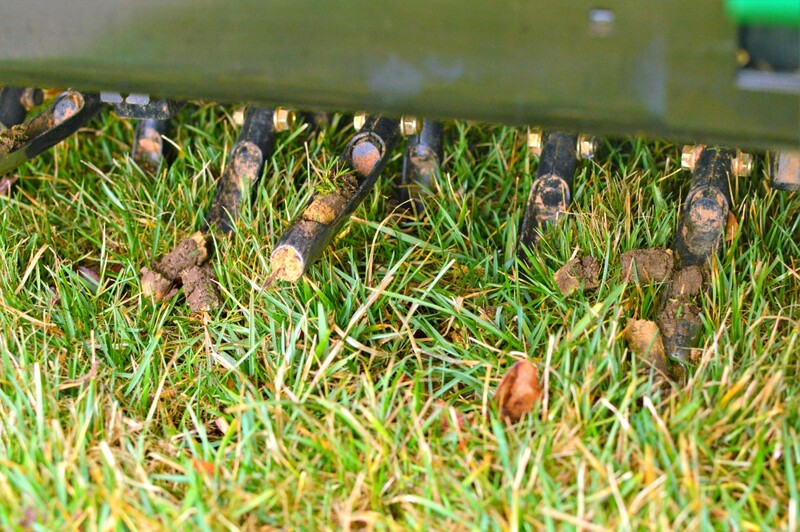 Most aerator tines may penetrate the soil about 3-4 inches. TV/Internet cables and underground pet fences are typically not deep enough to avoid damage. Other utilities such as electric, gas, and water lines are safe. Call 811 to have your TV/Internet cable marked if you do not know where it is. Keeping your new grass seeds constantly moist is the most critical factor for germination. Watering seeds once or twice per day will not produce the best results, and watering deeply is not useful for the seeds, which are at the surface of the soil. Plan to water briefly (just enough to wet the seeds at the surface of the soil) several times per day until the grass has sprouted. Tall Fescue seeds will begin germinating in 7-10 days if they are watered properly. If you don’t have an automated irrigation system, consider investing in a programmable timer for your hose-end sprinklers to help you continue frequent watering when you are not home. If you have sloped areas where erosion is a problem, then consider using erosion control blankets. Wheat straw is an economical material that helps prevent erosion and retain moisture but it usually contains wheat seeds, which may create a weed problem in your lawn over the winter. For flat areas, sprinkling on a seeding mulch such as Greenview Seed Accelerator will help keep the seeds moist but frequent watering is still required. Before aerating and seeding, mow at least a couple notches lower than usual, and either bag or rake/remove the clippings if possible. Mowing low and removing clippings helps sunlight reach the seeds, which may improve seed germination. After the renovation, skip a week of mowing and then mow at the usual recommended height of about 3.5″ for the rest of the growing season. 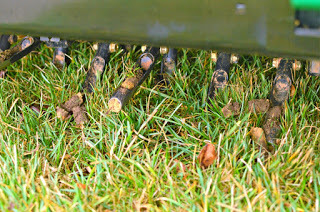 The day before your lawn is to be aerated push a screwdriver into the turf. If it easily penetrates 2-3 inches then the ground is soft enough for aeration and proper harrowing of the soil for optimum seed germination. If the ground is not already soft, then water it until it is soft. Do not overwater to the point that the soil is saturated or mushy. If you have low spots, holes or ruts in your lawn that are either a safety hazard or are bothering you, then before the fall renovation is a good time to fill them in with topsoil, which is fairly inexpensive by the bag at garden centers. Go to Crownover Green’s main website.